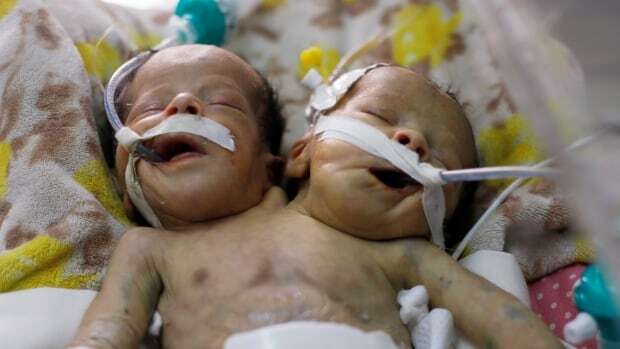 Conjoined twin boys born in Yemen who were in urgent need of treatment abroad died on Saturday, according to the local health ministry. Doctors treating two-week-old Abd al-Khaleq and Abd al-Rahim — who shared a kidney and a pair of legs, but had separate hearts, lungs and heads — in the capital of Sanaa had said the boys could not survive within Yemen’s war-ravaged health system and needed to be taken abroad. But the airport in Houthi-controlled Sanaa has been closed to civilian flights since 2015 because the Saudi-led coalition has control over Yemeni airspace. Only UN planes can currently land there, though reopening the airport is a key aim of UN-led peace talks, which began with negotiations in Stockholm in December. Yemen’s almost-four-year war pits the Iran-aligned Houthi movement against a Saudi-backed coalition trying to restore the government of Abd-Rabbu Mansour Hadi after it was ousted from power in Sanaa by the Houthis in 2014.